What Do You Think About Appraisers and Appraisals? Are you happy with the appraisal you get? Do appraisals really reflect the fair market value of the property? Do you think appraisers do a great job and spend enough time to derive the fair market value? Do you think appraisers do their jobs independently and they are not being influenced by lenders? Do you think appraisers should have a copy of sales contract? I address each question and give my personal thoughts based on my experiences on each question. I know when I do a comp it takes me at least 6-8 hours to do my job. I make necessary adjustments using several comparable properties that meet certain requirements. I don’t agree with and don’t use the CMA generated from MLS nor avg. price/SQ. Ft. from MLS to make offer or decide to purchase a house or not. Though, these could be used as a guideline, but not decision maker. Anyhow, it takes me at least a day to come up with a good comp. Also, I have been very good negotiator and were able to get the sale price in some cases about 20%-30% less than the listing price in a Buyer market (2012). 3 out of 4 contracts that I had, appraised exactly the same amount of the sales contracts and one came up only $1000 more than the sale price. I had seen the same trends, appraisals equal to sales price, with other REALTORS. That cannot be a coincidence, it only suggests that appraisers just looked at the sale price and use them without any further serious investigations. Otherwise, it implies that, all real estate agents are the same and all real estate agents are better than professional appraisers, which is not true at all. I just had a contract which was appraised exactly the same as the purchase price! Looking at the detail appraisal, I noticed the appraiser had reduced the Sq. FT. of the house about 140 Sq. Ft. out of 1800 Sq. Ft. which was in Tax roll from the beginning to come up and match with the sale price. That has created some bad test in my Buyer's mouth and all parties not happy at all. Who knows, he might have used some of the free mobile apps from cell phones to measure instead of measuring accurately with tapes, etc. He has also adjusted $10,000 for the differences between two properties fences which is ridiculous and wrong. I have also noticed, some appraisers, measure the living area from inside wall to inside wall but some measure from outside wall to outside wall. This could create hundreds of Sq. Ft. differences. See the picture below. In the following illustration, for simplicity purposes, let's say we have a large living room with building size of 50' by 50' (picture on the left). Now let's assume that large living room is divided into 4 smaller rooms by two walls, one vertical and one horizontal, with 1' foot. Outside walls are assumed 1/2 feet thickness. 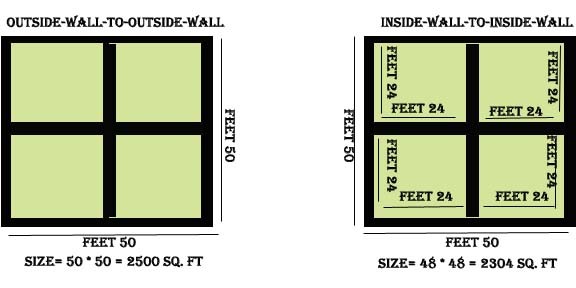 With these assumptions, the measurement for outside-wall-to-outside-wall is 50' * 50'= 2500' Sq. Ft., where as the measurement for inside-wall-to-inside-wall is 48' * 48'= 2304' Sq. Ft. As you see just with two small walls, we have about 200 Sq. Ft. differences which is a lot. Based on the above situations and experiences from the last couple of years, Buyers Market and Sellers Market, my answers to all of the questions set#1 are No. What are Your Answers to Questions Set#1? I know each of you have different experiences and views on these questions, and most probably, they are different than mine, but I like to see your points of view and reasoning’s for each of the following question. When and if I get enough inputs, I will publish the survey result here. Are you happy with the appraisal you get? Do appraisals really reflect the fair market value of the property? Do you think appraisers do a great job and spend enough time to derive the fair market value? 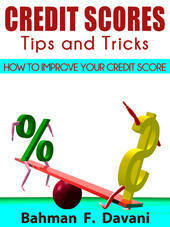 Do you think appraisers do their jobs independently and they are not being influenced by lenders? Do you think appraisers should have a copy of sales contract?